It is a new year, but we still face the same problems in long term care. America’s population is aging. While our seniors live longer, most require some form of assistance towards the end of their life. Despite the increasing need for senior living solutions, nursing homes and assisted living facilities continue to experience record-breaking reporting of abuse and neglect. Unsafe facilities foster dangerous environments, rife with preventable injury and wrongful death. An estimated 10% of seniors residing in facilities suffer abuse or neglect. Most of these claims go unreported for a variety of reasons. It is only by addressing the elder abuse and nursing home negligence problem head on that we can make a difference. 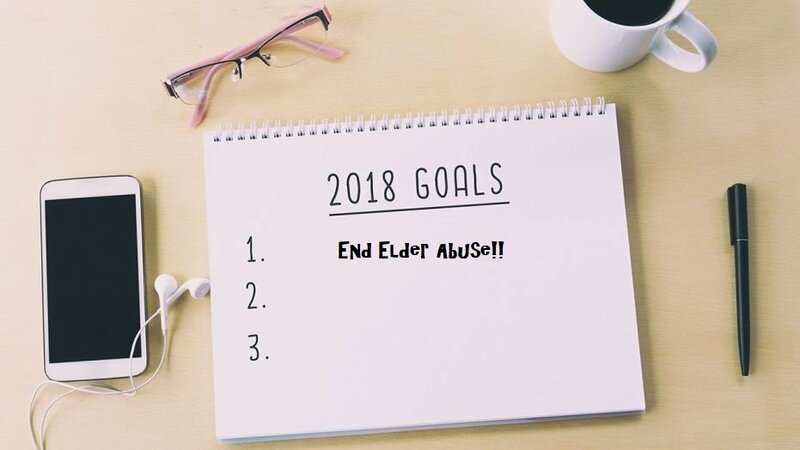 In the spirit of the new year, below are 8 ways to stamp out elder abuse and nursing home negligence inside long term care facilities. Having enough nurses and aides to care for patients is critical in solving America’s elder abuse problem. Human labor is expensive. For this reason, large corporate run facilities try to cheap out on labor and have skeleton staff numbers when visitation is low (night shift and weekends). Creating a reasonable state-mandated staffing ratio (based on resident acuity levels) would require facilities to employ an appropriate amount of nurses to assist residents. Without this, it will be difficult to contain the rising tide of elder abuse. When children misbehave, we punish them. If a someone breaks the law, we arrest them. Shouldn’t bad nursing homes face punishment for their wrongdoing? Right now, strapped government agencies barely have enough resources to police the facilities they are supposed to oversee. Worse, when they find negligent conduct, the at-fault nursing home or ALF receives a minimal fine. This is a drop in the bucket for a nursing home. Employing a ‘3 strikes and your out’ rule, or levying large financial penalties would add teeth to administrative findings of wrongdoing. This kind of serious punishment deters corporations from providing bad care, and we should strive to implement this kind of system in 2018. This is something every lay person can put into action. If your loved one resides in a nursing home or assisted living facility, visit at odd times. Make unannounced visits. If you keep the staff on their toes, inevitably, they will provide better care to your loved one, and other nearby residents. Many family members live out of state. Some residents are widowed and without close relatives. These vulnerable, isolated seniors are the residents who require visits the most. Unfortunately, these residents rarely get visitors. As a result, the aides become complacent with their care. If you know of a resident who could benefit from more visitation, see if a guardian can be appointed to oversee their care. If not, work with a volunteer agency to see if you can assist in getting visits for the resident. Unfortunately, seniors are at a disproportionately high risk of financial elder abuse as they age. Regardless of your suspicions, make sure to audit financial statements, credit card bills and bank accounts to make sure no one is exploiting the elderly person. This aspirational goal makes perfect sense. Who better to report elder abuse and nursing home negligence in a facility, than those who work and live in it? By truly empowering staff and other residents to anonymously report incidents of abuse and neglect, a state agency would have a solid start on their investigation. Elder abuse proliferates in dark corners of our society because we do not talk about it. Ignorance of this widespread problem allows it to continue to grow. People must share their experiences with others to encourage dialogue about this tough topic. Additionally, government resources should be spent to educate the public on how to report elder abuse in their region. It is important to speak out if you suspect elder abuse or neglect inside a long-term care facility. If you see something, say something. Report injuries to the state and speak with a nursing home abuse lawyer about your legal rights.